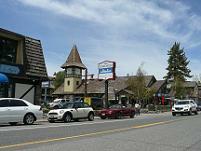 Olympic Valley is absolutely gorgeous and is one of the closest Cities Near Truckee! 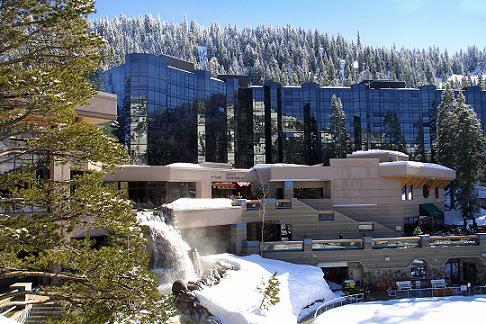 It is located 10 miles from Truckee along Hwy 89 from Central Truckee, and is located 7 miles from Tahoe City at Lake Tahoe. Shopping on the ground floor, and Condo's above. These are all popular Wedding Venues, including Weddings up at High Camp. No matter what the Truckee Season is, there are lots of Summer Activities and Winter Activities to keep you busy, and lots of Events and Music Festivals throughout the year! 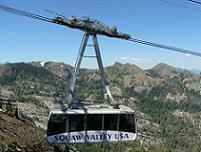 Squaw Valley has one of the two Cable Cars in the Tahoe area, and a trip up to High Camp is a MUST DO! The homes in the Olympic Valley Neighborhoods are beautiful, and there are lots of hotels and rentals available in the area. 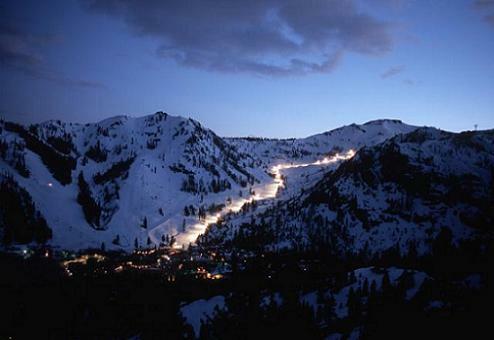 Photo Credit: Tom Day, used with permission from the Squaw Valley website. 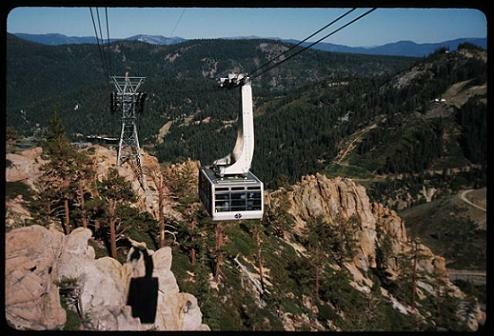 Squaw Valley's Cable Car up to High Camp. 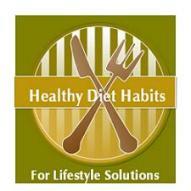 To find out more about the ride, check out my Cable Car page! 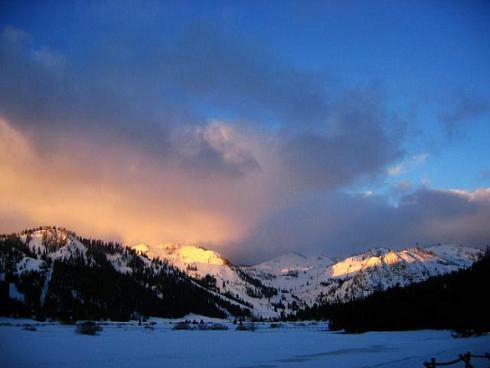 Photo Credit: Used with permission from the Squaw Valley website. Some of the summer activities at High Camp, are Hiking (Dogs can ride on the Cable Car to go hiking with you! 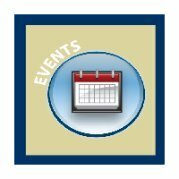 ), Mountain Biking, Paintball, Roller Skating, Swimming (pool opens in March), and Tennis. High Camp is also home to the Olympic Museum where you can learn about the 1960 Olympics which took place at Squaw Valley. High Camp also has several Restaurants and shops. Winter Activities at High Camp revolve around Ice Skating, Skiing, and Snowboarding. Photo Credit: Chris Beck, used with permission from Squaw Valley's website. 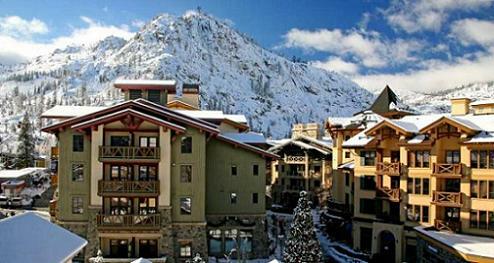 Resort at Squaw Creek, with part of the Ice Skating rink shown. 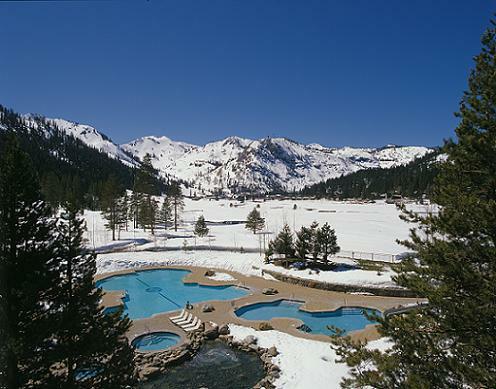 Resort at Squaw Creek pools and view of Squaw Valley. The golf course, beyond the pool, is covered with snow and used for Cross Country Skiing, Snowshoeing, and Dog Sledding in the winter time. 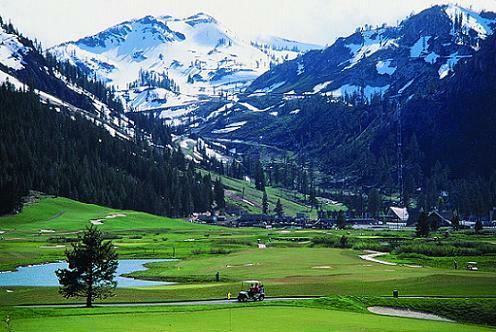 The Resort at Squaw Creek Golf Course is one of the many Truckee area Golf Courses! If you are interested in selling or buying a home in Olympic Valley, Christy Curtis, from Coldwell Banker in Truckee, is one the Truckee Travel Guide's recommended Realtor to use! Christy's experience, accomplishments, and awards are hard to beat, and she has a great Crew working with her! 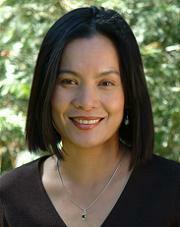 Ann Nguyen of Dickson Realty in Truckee is also another recommended realtor who is specializing in the Truckee and Lake Tahoe area.